Patricia Johnson Forgie, age 68, died at Cottage Hospital on May 4th with her family by her side. The cause of death was peritoneal mesothelioma. Patty Forgie was born in Stockton, California on February 10th, 1949. She received a BA degree from UC Davis and a PhD in philosophy from UC Santa Barbara, with a dissertation on Plato. 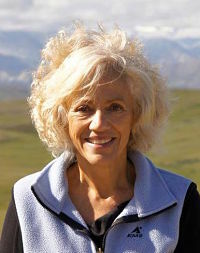 Patty taught philosophy at the University of Wisconsin at Milwaukee, at California Polytechnic University at San Luis Obispo, and for ten years at UCSB. In 1994, she was elected to a four-year term on the Goleta Union School District Board of Trustees. She was also a creative innovator in the education department at the Santa Barbara Botanic Garden and served for many years as the executive director of the University Religious Conference in Isla Vista. Patty Forgie was deeply loved by all who knew her. She was a vibrant, joyous physical and human presence in our lives. She completed three marathons, climbed Mt. Kilimanjaro, walked the Milford Track in New Zealand, backpacked into Machu Picchu and trekked in Nepal. She designed and produced children’s furniture and professional-level earrings and created dazzling origami constructions. She was an articulate and witty person of rich humanistic sensibilities, and her selfless devotion to her family and to those in need was a constant inspiration to her many friends. She is survived by William Forgie, her husband of 39 years, by her daughters Anna Forgie of Washington D.C. and Julia Forgie of Los Angeles and by her brother George Johnson of Berkeley, California. A memorial service will be held at 2:00 pm Saturday, May 13th, at the Santa Barbara Club, 1105 Chapala St. In lieu of flowers, please consider a contribution to the Mesothelioma Applied Research Foundation, curemeso.org.